In August, Bullfrog Power joined the Skidegate Band Council in Haida Gwaii, B.C. to celebrate the launch of the Haida Heritage Centre's 100 kW solar project. 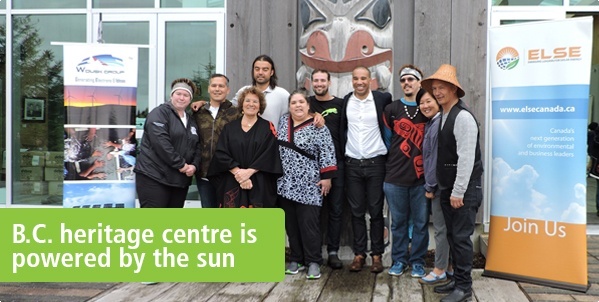 Through Bullfrog, you provided support for the solar array, which launched in time for the Haida Heritage Centre’s ninth anniversary and will reduce the Centre's reliance on diesel for its electricity. “This solar project will serve as a reminder that there are local solutions we can act on today to move toward a clean energy future,” says Billy Yovanovich, who is the Chief Skidegate Band Councillor. Read the full story as well as a CBC news article on the project. Bullfrogpowered customer Daniel Hall is a Toronto architect whose firm recently completed a sustainable renovation of a 1915 Victorian-style home, which included reclaimed building materials, state-of-the-art hot water heater pumps and onsite solar PV generation—and is also bullfrogpowered! Interested to learn more? Join a free open house on Saturday, September 23! The open house is part of Green Energy Doors Open, an annual event that highlights renewable energy projects across Canada. Click here to see a list of participating Bullfrog partners. Three hundred kilometres north of Saskatoon, a Métis community is building a future powered by green energy. Watch our video featuring Northern Village of Green Lake Mayor Ric Richardson—and see how the bullfrogpowered community is supporting renewable projects all across Canada. For those who suffer from asthma or allergies, the change in weather can sometimes mean runny noses, watery eyes or breathing difficulties. In a special guest article, bullfrogpowered The Lung Association offers a quick lesson on pollen and tips on how best to avoid it. As part of the bullfrogpowered community, it's now easier than ever to show your green side! Visit the new Rewards Centre in mybullfrog to choose your favourite Bullfrog items and have them shipped to you within two weeks. All items are free—plus, you can choose one premium item every six months. If you live in the GTA and are interested in sustainable home design, the Archetype Sustainble House at the Kortright Centre is hosting free public tours on Sunday, October 1. The tour features two LEED Platinum certified houses that demonstrate sustainable practices readily available today and those technologies on the brink of implementation in the market. Click here to register and learn more. Andrew Leach is an associate professor and environmental economist at the University of Alberta who played an advisory role in the creation of Alberta's Climate Leadership Plan. Bullfrog partner Clean Energy Canada recently spoke with Leach to learn about the new solar panel system on the roof of his garage, what it cost, and what you should know before installing your own. Calgary-based Community Natural Foods has been bullfrogpowered since 2009—and recently celebrated its 40th anniversary in August with a retro-themed country market. Festivities included live music, seminars and local vendors and artisans. Congratulations! Meet Jenni, a portable wireless device charger powered by the sun. Jenni uses smart technology to predict weather patterns for charging, and tracks how much solar energy you've charged and how much of a difference you're making for the environment. To learn more about how you can order your own Jenni and support the project, visit the Indiegogo page.